Where a permanent road is not required or may be cost prohibitive, Stratum Logics can also offer temporary haul road design and access road construction solutions that can be quickly deployed and safely reclaimed when the job is done. In addition to creating new access routes to difficult or remote locations, a temporary haul road design can also supply immediate, reliable access to a route where a future permanent road is planned. In many cases, reclamation of an access route to a forestry or mine site is not only desirable but may be a requirement in a project’s scope of work. Construction activity can negatively impact natural ecosystems and is a concern where job sites exist within protected areas such as national parks, national forest areas, nature preserves or animal habitats. It is Stratum Logics’ focus to provide unique and alternative solutions to the needs of oil & gas, mining, energy, construction, transportation and public infrastructure industries with the objectives of employing sustainable methods and delivering economic value. 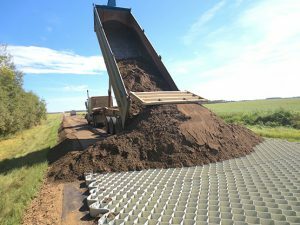 With the use of advanced geosynthetics, access roads to critical and strategic plant, mining and construction sites can be built cost-effectively in a very short timeframe, and in any season, including winter. Geosynthetic cellular confinement systems provide a ground reinforcement solution which also has the advantage of utilizing locally available and/or recycled materials for infill. 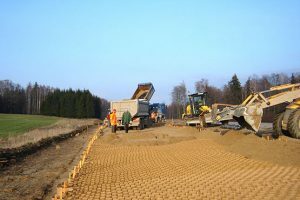 In situations where soft unstable soils would normally require costly excavation and replacement fill, Stratum Logics can utilize geosynthetic materials to create a solid base layer directly overtop of a less desirable sub-grade, without the need for imported granular infill, that will support the desired traffic load for the duration of its required life. Stratum Logics has the engineering experience and unique expertise in delivering value-engineered solutions for temporary access and haul roads no matter how challenging the conditions.